Did you buy an iPad 2 and are looking for a game that you can truly show off with? Real Racing 2 HD is probably one of the best apps made so far that takes full advantage of what the iPad 2 has to offer. Start with super high def graphics, add professional gameplay, a full featured career mode and ear rattling sounds, then add the ability to play this all on your HD TV via the $39 Apple AV Adaptor connected to your iPad 2 with an HDMI cable, and you have probably the coolest thing to hit the App Store, ever! If you though playing Real Racing 2 was hot, wait till you experience it on your 50″ HDTV. It pretty much turns your iPad 2 into an arcade style racer. I won’t bore you with the details, but if you want to know more read the rest of this review. 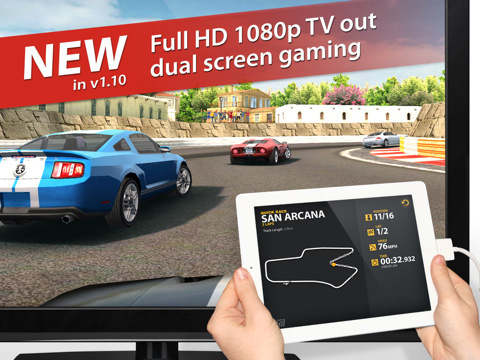 Real Racing 2 HD builds on the original Real Racing 2 and adds the ability to play the game on your TV. You buy the AV adaptor, hook it into your TV with an HDMI cable, and fire up this $10 game. Yes you do need to spend the extra $40 but it is so worth the investment, not to mention you can use the adaptor for other apps as well, like Keynote for example. The game outputs both Video and Audio to your HDTV, and the iPad 2 becomes the steering mechanism for driving, as well as for navigation around the menus. Holding the iPad 2 as a steering wheel feels good. Given the width of the iPad is about the size of a small rally car’s steering wheel, you almost forget you’re holding an iPad 2 after a while. It would be so cool if they sold an iPad 2 case that was made of thick leather to make it feel even more like a steering wheel. Having the adaptor and HDMI cable hanging off one side is only slightly annoying, enough to make me wish it was wireless. Can’t this be done using AirPlay I wonder? The quality of the graphics outputted to the television by Real Racing 2 HD are above excellent. The game plays smoothly, with just a slight bit of jaggedness which you only notice if you have a sharp eye from time to time, when going around sharp corners. Steering is done using the iPad 2 accelerometer and is calibrated out of the box to perfection. The default is auto acceleration, with tap to brake. I prefer to use the setting where you tap the right of the iPad 2 to accelerate, and tap the left to brake. There are a few other options as well for manual steering. While racing tap the top right of the iPad to toggle through a bunch of camera views, and tap the top left of the iPad to pause the game and get into the options menu. 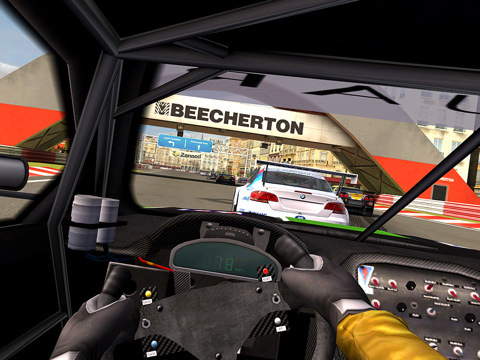 The iPad 2 shows a map of the game while you’re racing, although its almost impossible to focus on it, considering your eyes will probably be glued to the TV. When the race is over the iPad 2 screen shows the results screen. As always Real Racing has enough content and gameplay to immerse you for days on, with over 30 different manufacturers and 15 places to race around the world. Play in Cup, Head to Head, Championship, Time Trial and Elimination modes and build up your garage with money earned. Meetup with friends online and race with up to 16 other people in multiplayer mode. You connect with either Game Center or Cloudcell (from Firemint). You can record videos of your races and push them up to YouTube even. Yes, you need an iPad 2, this game and the AV adaptor. Yes you will have a blast, and yes you should be playing Firemint’s Real Racing 2 HD on your 1080p TV right now! I’m excited to see what other games adopt this style of gameplay. AppSafari review of Real Racing 2 HD was written by Joe Seifi on April 21st, 2011 and categorized under Action, App Store, Arcade, Featured, Games, iPad apps. Page viewed 5045 times, 1 so far today. Need help on using these apps? Please read the Help Page.